the pre-collision braking function is operating a buzzer also sounds. Slow the vehicle by applying the brakes. Indicates that the engine was stopped with the shift lever not in p a buzzer also sounds. Indicates that the engine was stopped while driving a buzzer also sounds. → Stop the vehicle in a safe place such as the shoulder of a road. Indicates that your vehicle is nearing the vehicle ahead (in vehicle-to-vehicle distance mode) a buzzer also sounds. → Slow the vehicle by applying the brakes. Alerts the driver that the vehicle has deviated from the lane (while the lda [lane departure alert] system is operating) the lane line on the side the vehicle has deviated from flashes. The warning buzzer sounds continuously. → Check around the vehicle and back to inside of the lane lines. Indicates that one or more of the doors is not fully closed the system also indicates which doors are not fully closed. sounds to indicate that the door(s) are not yet fully closed. → Make sure that all the doors are closed. sounds to indicate that the hood is not yet fully closed. sounds to indicate that the back door is not yet fully closed. → Close the back door. sounds to indicate that the glass hatch is not yet fully closed. → Close the glass hatch. 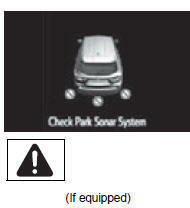 Indicates a malfunction in the intuitive parking assist-sensor the assist-sensors flash. → Have the vehicle inspected by your toyota dealer. Indicates that an intuitive parking assist-sensor is dirty or covered with ice a buzzer also sounds. Indicates a malfunction in the eps (electric power steering) system a buzzer also sounds. Indicates that the vehicle is being driven at 3 mph (5 km/h) or more with the parking brake still engaged a buzzer also sounds. → Release the parking brake. Indicates that the engine coolant temperature is too high a buzzer also sounds. 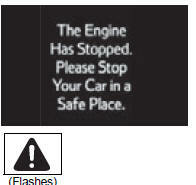 Indicates a malfunction in the vehicle¢�s charging system. Indicates that the radar sensor is dirty or covered with ice a buzzer also sounds. Indicates that the dynamic radar cruise control system is unable to judge vehicle-to-vehicle distance a buzzer also sounds. → Turn off snow mode. If the windshield wipers are on, turn them off or set them to a mode other than high speed wiper operation. Indicates that the lda (lane departure alert) system is suspended (the camera sensor temperature is higher than the operation temperature range) a buzzer also sounds. → Restart the lda after driving for a while. Indicates that a blind spot monitor sensor or the surrounding area on the bumper is dirty or covered with ice a buzzer also sounds. 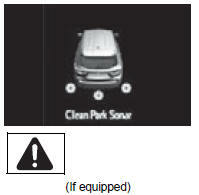 → Clean the sensor and its surrounding area on the bumper. the dynamic radar cruise control system press the "on-off" button once to deactivate the system, and then press the button again to reactivate the system. Indicates a malfunction in the lda (lane departure alert) system a buzzer also sounds. Indicates a malfunction in the pcs (pre-collision system) a buzzer also sounds. Indicates a malfunction in the bsm (blind spot monitor) system a buzzer also sounds. 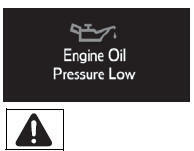 Indicates abnormal engine oil pressure a buzzer also sounds. Indicates that the automatic transmission fluid temperature is too high a buzzer also sounds. Indicates a malfunction in the awd system a buzzer also sounds. Indicates that the lda (lane departure alert) system cannot be used because the vehicle speed is lower than approximately 32 mph (50 km/h) → drive the vehicle at 32 mph (50 km/h) or higher. → Operate the steering wheel with more force than usual. Indicates that the engine switch is turned off or turned to accessory mode and the driver¢�s door is opened while the lights are turned on a buzzer also sounds. → Turn the lights off. Indicates that the moon roof or panoramic moon roof is not fully closed (with the engine switch off, and the driver¢�s door open) a buzzer also sounds. → Close the moon roof or panoramic moon roof. 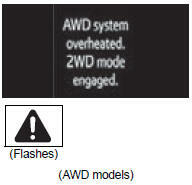 Indicates that the awd system is not currently functional a buzzer also sounds. → Reduce vehicle speed or stop the vehicle in a safe place until the warnings clear. In this case, do not stop the engine. 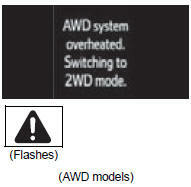 Indicates the awd system has overheated → immediately stop the vehicle in a safe place and contact your toyota dealer. 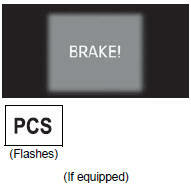 Indicates a malfunction in the brake override system a buzzer also sounds. Indicates a malfunction in the automatic high beam system a buzzer also sounds. 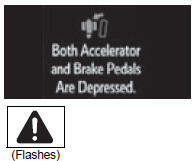 Indicates that the accelerator and brake pedal are being depressed simultaneously → release the accelerator or brake pedal. 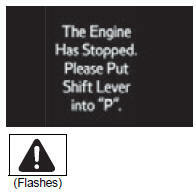 Indicates that the washer fluid level is low → add washer fluid. Indicates that remaining fuel is approximately 2.9 Gal. (10.7 L, 2.4 Imp. Gal.) Or less → refuel the vehicle. 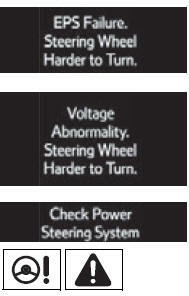 Indicates that the trac (traction control) system has been deactivated → turn the trac on. → If necessary, perform maintenance. Comes on approximately 5000 miles (8000 km) after the maintenance data has been reset. (The indicator will not work properly unless the maintenance data has been reset.) → Perform the necessary maintenance. 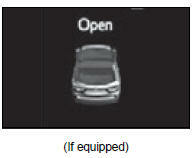 Indicates that the automatic high beam switch is pressed while the headlights are in low beam. → Turn the high beam on and press the automatic high beam switch again. 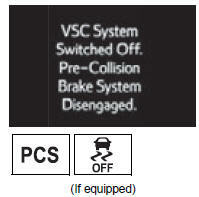 Indicates that, since the vsc (vehicle stability control) system was turned off, the pre-collision brake system operation is stopped → turn the vsc on. Indicates that the pcs (pre-collision system) is not currently functional because the grille cover or the sensor is dirty → check the grille cover and the sensor and clean them if they are dirty. *: Refer to the separate �scheduled maintenance guide� or �owner�s manual supplement� for the maintenance interval applicable to your vehicle. In the following situations, a warning message will not be displayed even if a lane line is crossed.